Rose E. Brett was the unofficial poet laureate of Hollenbeck Palms, and in 1946 a small selection of her light verse was published in pamphlet form as “Homespun Rhymes.” The price was $1. We were lucky enough to find a copy of this scarce volume at Caravan Book Store, the last survivor of downtown LA’s book row. 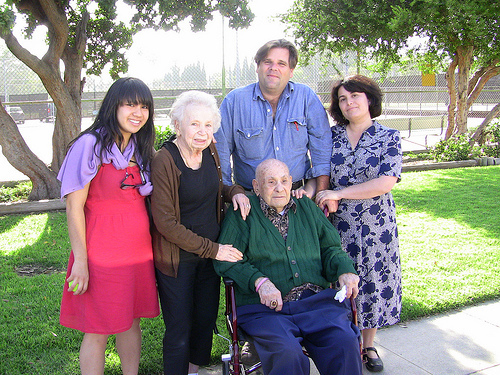 According to the records of Hollenbeck, Rose and her husband Cyrus Willard Brett moved into the home on July 6, 1934. Cyrus died in 1938, and Rose stayed on until her own death on October 19, 1948. This is the second of a series of blog posts presenting the sweet, forgotten, and still very timely rhymes of Rose E. Brett of Hollenbeck. We hope you love them as much as the OGs do! And, lo, a modern rug. In this episode, Cutie and granddaughter Chinta take in a Friday matinee of the well-received Joan Rivers documentary “A Piece of Work.” While Cutie likes Joan’s personality and pep, she’s underwhelmed by the film, and takes the opportunity to teach Chinta the grandmotherly art of walking out on a movie just late enough that a reasonable amount of time gets killed, but the theater manager will still give you vouchers to come back another day. In April 1937, Barbara went to Poinsettia Park in Hollywood and noticed a nice looking young man leaning against the tennis court fence. She liked his curly brown hair and his legs, so she brought him home to her parents’ house, and 72 years later, Barbara and Harry Cooper are The OGs, America’s favorite internet grandparents. Here they are with their granddaughters Kim and Chinta, and Kim’s husband Richard, on a return visit to the park where all the magic began. 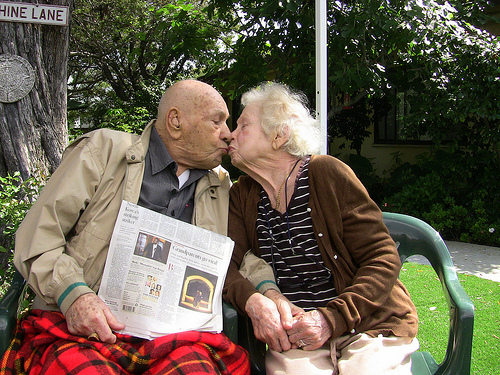 After 72 and a half years of marriage, how do you keep the spark alive? If you’re Cutie, the answer is a post-breakfast dance for her sweet PopPop. Let’s slip in, like a fly on the wall, and see what a lovely time they’re having. P.S. If you like Cutie’s Dance of Love, check out Pop Pop’s Song of Love! Hello new friends, and welcome to our home on the web. We hope you’ll enjoy exploring all our videos, fun photos, Cutie’s restaurant reviews, follow us on Twitter and will become our fan on Facebook, too. This is an introduction to some of our favorite parts of the OGs blog. Of course you won’t want to miss our 100% true theme song, written for us by our sweet and talented friend The Ukulady. One of our most popular videos shows us cracking up as our granddaughter Kim tells us some corny old jokes. We’re told our laughs are infectious, which goes along well with this whole "going viral" business! The OGs send a message of thanks and welcome to all their new fans. It’s not every day that a picture of someone necking with their sweetheart appears on the cover of the Los Angeles Times! You want me to review this? Throw it away and start shooting all over again. It had no continuation, it had no charm, it had no storyline. It’s just a bunch of stuff, mostly cuts from the 1930s. I think it’s nothing new, it’s nothing charming. It’s got no message. I’m sorry, I did not enjoy this. It was a take off of flappers. But flappers were more consistent and more fun. This was not fun. I think she doesn’t come across with reaching the public emotionally. She’s just — there. [Cutie, did you find the imagery shocking?] Shocked? I’m annoyed. She was a waste of my time. I’m sorry, maybe the whole world thinks she’s great, and people who know talent will recognize what she has got to offer. She isn’t doing anything new. It’s the same thing that we have seen, only take offs. [Cutie, do you have some constructive criticism for Lady Gaga?] Sure. Lady Gaga, get yourself a good agent and go to school and get some talent! What? I think that’s constructive criticism!